Now in its 8th edition, the Tuscany International Workshop and Jazz Festival, titled Jazz in the Castle, takes place from August 4 – 11 in Certaldo. Organized by the Global Music Foundation, this set of events brings together renowned musicians of improvised music. Students of jazz will be especially drawn to the festival’s program of opportunities to learn directly from the musical artists. Besides numerous smaller concerts, some enlivened with aperitifs or full-on dinners, Certaldo will be all jazzed up with jam sessions and the three main concerts not to miss will be held in the town’s historic Palazzo Pretorio. 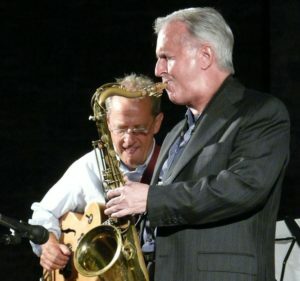 Famous American saxophonists Scott Hamilton and Jean Toussaint will perform on Wednesday, August 5. On Friday, August 7, American vocalist René Marie, a rising star, will be on stage along with the Bruce Barth Trio. The festival’s workshop students and instructors will offer a free concert to celebrate the end of the week’s events on Monday, August 10 at 6:30 pm. Festivalgoers can purchase a pass for all these concerts (35 euro) or single entrance tickets (15 euro each). The festival will open on Tuesday, August 4 with the inauguration of “AERIS – Phocuzz,” an exhibition of works by Antonio Porcar Cano, award winning photographer and artistic director of Café del Mar Jazz club in Castellon, Spain. This exhibition is part of a larger show sponsored by the Milan 2015 EXPO, #4elements1palace, and a celebration of the four elements. Porcar Cano’s photographs represent air. His images conjure the intangible vibrations of sound carried by the air. His portraits of the great masters of jazz capture the unique rhythm and atmosphere of this musical genre. “AERIS – Phocuzz” is on display at Palazzo Pretorio until September 6, 9:30 to 1:30 / 2:30 to 7 pm. Entrance, which includes access to Certaldo’s network of museums, is 4 euro, while admission is free for town residents. Inauguration of “AERIS – Phocuzz” a photo exhibition by Antonio Porcar Cano, who will be present for the opening. This extremely tight quartet is already well known and has to its credit a popular cd. Scott Hamilton, one of the most important saxophonists today, will certainly lead his group in a memorable performance. René Marie and the Bruce Barth Trio. René Marie is the new star on the horizon of jazz singing. Known for her ability to connect with the audience, along with pianist, Bruce Barth, this ensemble is sure to offer a uniquely entertaining experience. A Tribute to the Jazz Messengers. This concert is dedicated to the great drummer, Art Blakey, and will express the essence and tribal rhythm of jazz. August 10, Parterre of Palazzo Pretorio (6:30 pm, free admission).